The term “Public Ivy” was coined by Richard Moll in Public Ivies: A Guide to America’s Best Public Undergraduate Colleges and Universities which was published in 1985. Moll identified eight public institution with Ivy League characteristics. He argued that these characteristics, which included both academic and non-academic elements, provided an Ivy League experience at a public school price. According to the Los Angeles Times, Moll determine the criteria for a distinctive college to be “selective admissions, a quality education program focused on the liberal arts and enough money to buy a superb faculty and build an attractive campus.” Moll created his list based on these criteria and then consulting with others and visiting campuses. Others have since expanded this list. Howard and Matthew Greene added eleven universities to the list. 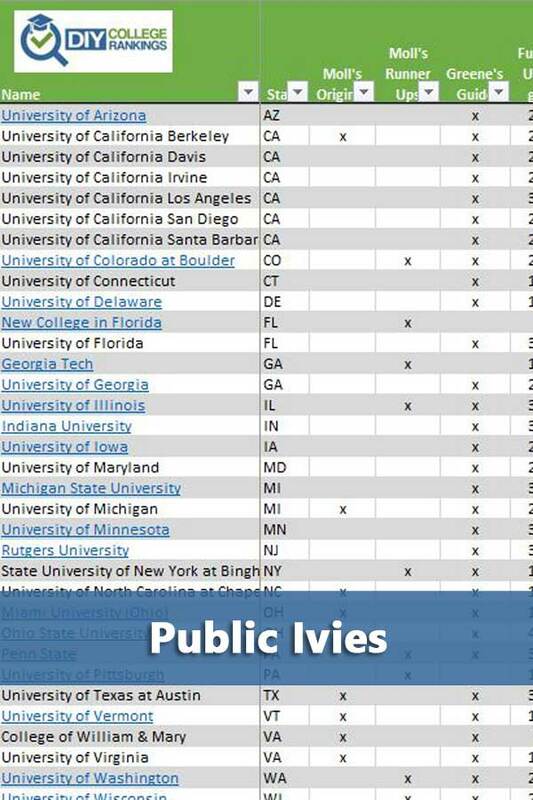 They also created a list of 30 “hidden” public ivies. Often the term is used to identify top ranked public universities. The following table includes all schools on the Greenes’ and Moll’s lists.